SCOTTSDALE, Ariz., June 14, 2018 /PRNewswire/ -- Fans of Louisa May Alcott's timeless classic, Little Women, and the work's subsequent films will be drawn to theaters this September as Pinnacle Peak releases the first-ever modern cinematic retelling of the classic story. LITTLE WOMEN in theaters only September 28, 2018. To celebrate the theatrical release, Pinnacle Peak developed a strategic media plan focused on Food Network, which includes an exclusive trailer release and sponsorships across key network series (ALT or shows). This campaign promoting the release will run from June through September, across Food Network's TV, websites, and social platforms. Pinnacle Peak is also partnering with the Parents Television Council, who provided their seal of approval for the film, on special pre-release theater events for local premieres. Additionally, Pinnacle Peak created opportunities for school field trips, girls' night out events, and organizational events, in theaters the week of release. Their school program includes seven educational ideas that tie in both the film and also the classic novel, for a Dream Together campaign to support students in achieving their goals. Additionally, their organizational programs include great resources tied to the film, including an online portal for individuals to create vision boards, inspired by the sisters' castles in the air portrayed in the film. 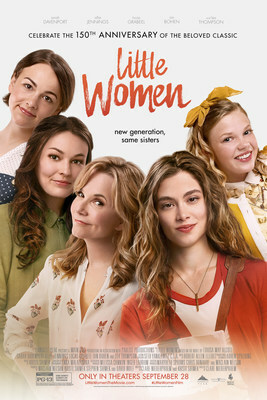 LITTLE WOMEN also stars Sarah Davenport as "Jo," Melanie Stone as "Meg," Taylor Murphy as "Amy," Allie Jennings as "Beth," Ian Bohen (Teen Wolf) as "Freddy," Lucas Grabeel (High School Musical, "Family Guy") as "Laurie," and Bart Johnson (High School Musical) as "Papa March." Pinnacle Peak is an Arizona-based film company bringing inspirational movies to theaters across North America. The first film to be released by Pinnacle Peak is Little Women, a modern retelling of Louisa May Alcott's classic novel. Find out more at http://pinnaclepeakpictures.com.